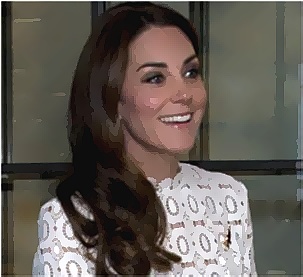 The Duchess of Cambridge is wearing a long white dress with a high neck top in the label’s signature floral crochet as well as a pleated skirt with a split. It appeared that she favorite brand since the dress is designed by Self Portrait. She also added an enameled poppy on the bodice of her dress and styled her hair loose while meeting the stars of the film, including the ginger domestic cat, Bob. She also wondering if the cat was purring or growling when she tried to stroke the cat.